This is the fourth in a series of ten in which we meet one of the San Diego 10 orcas and hear from an advocate who continues to be one of the voices of these imprisoned voiceless, never stopping until the whole world listens. After reading about Prisoner #4, Orkid, please scroll down this and “meet” one of the top San Diego 10 Prisoner Advocates. This week’s Advocate is Pamela Slater-Price, former San Diego County Supervisor. Born on September 23, 1988, during a live Shamu show at Sea World San Diego, Orkid made her debut in front of thousands of spectators. Of course, a natural orca birth in the wild wouldn’t be bombarded with the noise and cameras and invasion of such a personal entrance into the world as this baby experienced. But Orkid was a captive being—50 percent Icelandic (from her mother, Kandu V) and 50 percent Northern Resident/Canadian (from her father, Orky) – born into the prison world of enforced performance in the name of entertainment. In fact, her parents personify really all that is wrong with captive, performing orcas. It is no surprise that Orkid has attacked trainers on multiple occasions. Is it any wonder? From the very beginning of her entrance into the world she encountered loss. When she was only three days old, her father Orky II, died, hence, her name in his memory, “Orky’s Kid.” Orky died of acute pneumonia and chronic wasting—which meant he lost a great amount of weight before his death. Orky’s pectorals were huge and his flukes curled completely. His tremendous size can be seen in both of his daughters, who have grown to be quite large like their father. Orky’s only living captive relatives are Orkid and Kayla. At one time Orky was actually called “Snorky.” At almost 22 feet long and 11,000 pounds, he was one of the largest whales ever held in any aquarium. The following year of her father’s death, at just one year old, young Orkid experienced another life-changing passage in front of thousands during a live show. 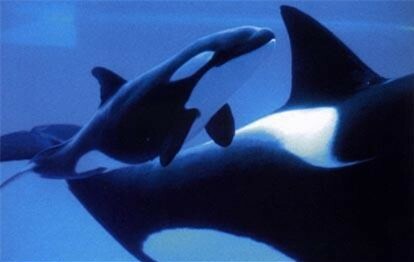 She watched her mother, Kandu V, bleed to death following a brutal altercation with one of the other orcas, Corky II. One of the theories for Kandu V’s aggression towards Corky2, was that Orky and Corky were mates, captured from the same British Columbia area and then sold to Sea World and moved to San Diego. So it’s possible that the violent clash that ensued — was an act of dominance by Kandu V over Corky2. The huge blow broke Kandu V’s jaw and severed an artery in her head. Forty-five agonizing minutes later, spouting blood with every breath, Kandu V sank to the bottom of the pool and died, bleeding to death. For weeks after her mother’s death, Orkid would circle around the pool, calling out and vocalizing in distress. An encounter such as this — a fight to the death between two orcas—has only been witnessed by those observing orcas trapped in unnaturally confined prisons. In the wild it doesn’t happen. They just avoid each other if there is tension. Just swim in opposite directions. Killer whales don’t kill each other. They don’t kill humans. They are gentle beings and when left to live in their natural ocean worlds comfortable within their own distinct pods, they are content, happy to be free. Highly intelligent (having been nicknamed by trainers ‘The Rocket Scientist’), Orkid knows hundreds of behaviors. However, only the most senior trainers are to work with her, as she has shown aggression toward trainers in the past. After an incident in 2006 where she dragged a trainer to the bottom of the show pool, Orkid has been barred from performing waterworks with trainers. Orkid has been artificially inseminated many times, but has so far not gotten pregnant. The story of Orkid and her parents, Kandu V and Orky, is a tragic one, worthy of Shakespeare. This is the poster family for the California legislation proposed this spring: Assembly Bill (AB) 2140, the Orca Welfare and Safety Act. With its introduction by Assemblymember Richard Bloom, people who have been concerned for the safety and welfare of captive orcas and their human trainers have a concrete legislative proposal to advocate. 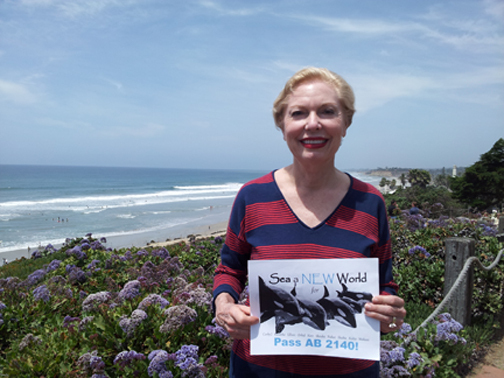 AB 2140 is designed to: end the use of performing orcas in theme shows, ban captive breeding and prohibit the import and export of the so-called “killer” whales in California. Currently, SeaWorld San Diego is the only place in California where orcas are kept captive, with 10 currently held and profiled in this series. San Diego’s elected leaders should be concerned about a continuing decline in visitors to San Diego SeaWorld if SeaWorld Entertainment Inc. continues to ignore the growing movement for humane animal treatment worldwide. San Diego IS a world class tourist destination, and we need to embrace this movement to maintain this stature. In 2008, 63% of California voters passed Proposition 2 to prohibit the confinement of certain farm animals in a manner that does not allow them to turn around freely, lie down, stand up, and fully extend their limbs. The measure deals with three types of confinement: veal crates, battery cages, and sow gestation crates. The key portion of the statute will become operative on January 1, 2015. Farming operations have until that date to implement the new space requirements for their animals, and the statute will prohibit animals in California from being confined in a proscribed manner thereafter. How is transitioning captive orcas to sea pens from very confined cement tanks different from this? As recently reported by the Voice of San Diego, Disney’s two theme parks in Anaheim and Universal Studios’ park in Hollywood each draw more visitors and revenue than any of SeaWorld Entertainment’s parks. SeaWorld Entertainment could use the incredible digital technology available today to simulate the REAL Sea World, just as more and more worldwide corporations are using digital and other advanced technology to eliminate the need to use live animals for testing drugs and consumer products. On the occasion of SeaWorld’s 50th Anniversary founding here in San Diego, concerned San Diegans are calling upon SeaWorld Entertainment to embrace the 21st Century. It is more apparent than ever that successful businesses adapt to changes in their market, or they fail. Like most people growing up in coastal San Diego, Pamela visited Sea World often from its earliest days. She was happy to enjoy a day in the park, which really started out a natural park with few if any of the amusement park features it has added over the years. Pamela finished college and went on to work and start her adult life. After becoming a wife and mother, she often took her young daughter to enjoy an afternoon at Sea World. Later, she became a teacher and took her elementary school students to learn about the world of the ocean and its inhabitants. But then something happened that would ultimately transform Pamela’s life path. “I rethought the whole idea of animals in captivity because of little Orkid and her poor mother. Seeing life from the perspective of the animals opened up new worlds and caused me to begin a journey to rescue animals and to educate people, especially children, of the proper relationship we can have with the natural world. Orcas are magnificent beings, beautiful ocean swimmers who often swim 100 miles per day! They have strong families and their own languages and dialects. They mourn the separation from family members. Mothers and babies never fully recover from such separation. We simply do not have the right, nor should we have the desire, to imprison these beautiful creatures for our own entertainment and profit. “Finally our consciousness is being raised to realize that we must now do all we can to reverse this destructive path and work to free the captives that can survive in the wild, as well as ceasing any further captive breeding or performances. We must appreciate nature as it is intended. That is why AB 2140 is so very important. Sea World has become primarily an entertainment model with games, rides and a carnival atmosphere. The orcas and sea life are really out of place there. “Sea World will survive without imprisoning orcas and other sea mammals. The rescue work they do is commendable and provides them with an opportunity for research and rehabilitation. And it requires such a very small part of their profits. Sea World has a great opportunity to change their model and become an advocate for animals in the wild. And they will gain much public support for doing so. “In my 20 years as a San Diego County Supervisor, and 4 years as Encinitas Mayor and City Councilmember, I have been motivated to use the public forum to do good work on behalf of animals and the natural world. I am happy to have had the chance to have a public voice on this and other matters. I also had the chance as a teacher to educate children and families. And it is clear to me now that no matter what your walk of life, you can make a difference by living your beliefs. It really is simple and so very liberating to do so, and I encourage everyone to support AB 2140. It is truly the right thing to do. Such a heartbreaking story. Orkid’s story is one of the saddest I have heard, though all captive cetaceans have suffered greatly in captivity. I am glad her parents’ deaths did not go in vain and that someone has learned and understood the truth. Thank you Pam Slater-Price for your advocacy and passion. Thanks again to Cara for this wonderful and informative series! Yes, please do this, Zach!!!! My guess is Orkid would say “Boycott SeaWorld! and Let me the heck out of this tank!” Who knows if she could make it in the wild after experiencing all this though. If this story doesn’t convince people why keeping orcas in tanks is wrong, nothing will. When someone as mainstream as Pam Slater-Price is against 0rca captivity it shows just how much credibility SeaWorld has lost and continues to lose. I first came to San Diego in 92 and I’m proud to say that I have never been to SeaWorld. While living in OB I talked every guest who came to visit me out of going to SeaWorld. The misery Orkid has endured only has meaning if it is a lesson to us all.